The Senate Finance Committee gave its approval to U.S. Rep. Tom Price as HHS secretary in a vote that excluded committee Democrats. Price's nomination still needs to be voted on by the full Senate, which is likely to approve him along straight party lines. Tuesday's vote took place during an executive session of the Senate Finance Committee called by Chairman Sen. Orrin Hatch (R-Utah). “As Congress navigates the minefields of tax reform, healthcare reform and other vitally important matters, we need willing and competent partners to lead these crucial Executive Branch departments," Hatch said in a statement that confirmed the committee had also advanced the nomination of Steven Mnuchin to serve as U.S. Treasury secretary. Price, an orthopedic surgeon from Georgia, sat on the Health Subcommittee of the House Ways and Means Committee. During his time in Congress, Price proposed legislation to repeal the Affordable Care Act. During confirmation hearings before the Senate Finance and Health, Education, Labor and Pensions committees, Price mostly dodged questions aimed at pinning him down on maintaining ACA provisions such as not allowing insurance companies to discriminate against people with pre-existing conditions and providing free preventive care. He has been outspoken about his desire to give states more control over Medicaid. 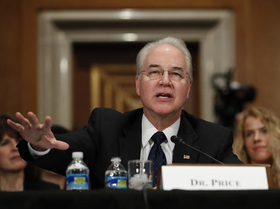 Democrats sought to block Price's nomination over reports that Price did not tell the truth to the Senate Finance Committee that he received a preferential discounted offer of stock from an Australian biotechnology company. Based on that report, they boycotted Tuesday's Finance Committee hearing, leaving the panel short of a quorum needed to vote to send Price's nomination to the full Senate. The Democrats are demanding more information about Price's healthcare-related stock deals before deciding on his nomination. Because of the Democrats' boycott, Republicans had to suspend committee rules to hold the vote. Price's nomination by President Donald Trump has been mired by controversy over his many healthcare stock trades. In January, CNN reported that Price bought shares in Zimmer Biomet a week before introducing a bill to delay the comprehensive joint replacement bundled-payment program.